Sometimes I really enjoy when cuisine takes some interesting voyages to get from its origins to its current state. A good example of this is the concept of the Irani Bombay café. The Irani café concept dates back to the 19th century, when a large wave of Zoroastrian immigration into India resulted in a large number of cafés opening that were welcoming to a good cross-section of society; Sikh dining next to a Hindus and Zoroastrians, with an interesting Indo-Iranian cuisine focusing on chai, fragrant Biryanis (a dish that actually traces back to Iran), omelets, curries, and naans. It’s also, unfortunately, a culinary heritage that’s dying out, with fewer than 30 classic Irani cafés still remaining in Mumbai, and similar number in Hyderabad. Into this scene comes another migration, with British restaurateurs Shamil and Kavi Thakrar who decided to bring the concept to London. 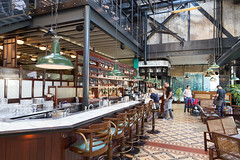 The result was Dishoom, a small chain of “Bombay-Style Cafes”. 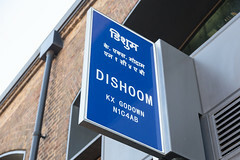 Dishoom opened their first spot in 2013, and since then, the result has been some rapid popularity, indeed, a previous attempt at visiting Dishoom showed that many of their locations are hopelessly overwhelmed with long lines at lunchtime, although some of the more recent locations, like the Kings Cross location located in an old factory, are surprisingly spacious and able to move a lot more diners through. But, more importantly, Dishoom also does breakfast. Arriving at the Kings Cross location with our friend Jeff at 8am (which is a bit early for much of the London breakfast crowd), we found ourselves in a beautifully remodeled space in a nice upstairs seating area in a dining room only lightly packed. I started out with a simple beverage, a chocolate chai. 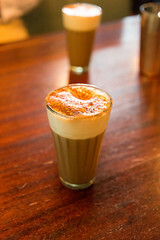 I’m usually a chai purist, liking my “chai” to be just tea, milk, cardamom, ginger, and cinnamon, but Dishoom surprised me by doing a nicely pleasant combination of a traditional chai with a subtle dark chocolate chocolate note. The end result was pleasant tea with a real cardamom and ginger bite that found quite pleasing, although next time I may opt for the traditional chai or a monsooned Malabar coffee (another favorite of mine). For breakfast itself, there were a lot of options, including the “Big Bombay”, which is basically an English fry-up with some Indian influence in the form of Indian-style rolls and spiced eggs, but I opted for the somewhat simpler Akuri: three spicy scrambled eggs served with home-made buns and a grilled tomato. A simple dish, this was primarily in the spicing: three scrambled eggs (done with the European style slow scrambling with gentle curds), a nice peppery spice, and some unexpectedly pleasant grilled rolls. I’d definitely get this again if I wanted a lighter breakfast. 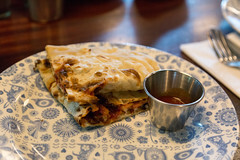 But the real star of the show was a relatively simple side item I ordered (one that Dishoom is known for): bacon naan. Basically, this is “Indian” meets “Traditional English”: fresh baked naan, a few strips of some nicely aged streaky bacon, a light schmear of cream cheese, and a little chilli jam, this was a pleasing variation on my favorite “bacon butty”. I’d easily get this again. 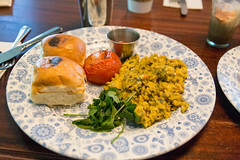 My visit to Dishoom was enjoyable: the service pleasant and efficent, the breakfast un-rushed, and there’s enough interesting things going on with the menu (like spiced chicken livers as another breakfast option), that I really do want to come back and explore some more, either for another breakfast, or actually wading into the crowds at lunch time. For the first part of this trip to San Antonio, we were staying at the JW Marriot San Antonio Hill Country. While it’s a rather nice resort (and indeed, has a really good water park and some nice bars), I didn’t find any of the breakfast options there appealing. Since the general area is well known for Tex Mex food, we ended up looking for a good Tex Mex breakfast place in Northeast San Antonio (since the JW Marriott resorts is rather far outside of downtown). We ended up finding one place that had a lot of good reviews: Grumpy’s Mexican Cafe on Farm-to-Market Road 2252.